Loyd Grossman Tomato & Chilli Sauce has a robust flavour that makes an excellent casserole base for chicken thighs or pork chops and works well with spicy chorizo sausage. You can find the sauce on the grocery shelves. Preheat the oven to 180°C, gas mark 4. Heat a large frying pan until hot, add the chorizo and fry over a medium heat for 2-3 minutes, or until beginning to brown. Add the onion and cook over a low heat for 5 minutes, stirring occasionally, until soft. Transfer the onion and chorizo to a large casserole. Return the frying pan to the heat and add the chicken. Fry over a medium heat for 4-5 minutes on each side until golden, then transfer to the casserole. Pour the wine or water and tomato and wild mushroom sauce into the frying pan and bring to the boil, then pour into the casserole, cover and cook in the oven for 40-50 minutes, or until the chicken is thoroughly cooked, the juices run clear and there is no pink meat. Season with freshly ground black pepper and stir in the parsley. 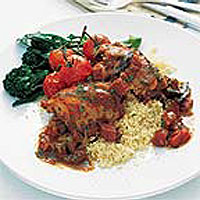 Serve with couscous, steamed tenderstem broccoli and a few roasted Waitrose Cherry Tomatoes on the Vine. For a milder flavour replace the chorizo with Italian pancetta pieces. Get ahead: The casserole can be made up to the end of step 3 a day ahead and stored covered, in the fridge, or frozen for up to 1 month. Defrost thoroughly, then bring to the boil over a medium heat and simmer for 10-15 minutes until piping hot. Stir in the parsley just before serving. Note: Wash hands, equipment and work surfaces thoroughly after handling raw poultry.